Twenty-six days after the mid-air collision between the Lazy Daisy and Lead Banana over Magdeburg, Germany, George Edwin Farrar (my dad) was allowed to write his first letter home. At the time, he was in a prison camp hospital, unable to walk from injuries suffered in the collision. Farrar was also treated for wounds possibly sustained from the collision and/or perhaps during his capture. In a letter to his mother after he was liberated in May of 1945, he wrote, “When I hit the ground I received a little rough treatment from the Germans, but I expected it.” The “rough treatment” could have been anything from my recollection of what he described as being beaten with a stick to my Aunt Beverly’s recollection of his telling of being attacked with farm implements, like pitchforks and hoes. She also recalled his telling of the German soldiers saving him from being killed by the German peasants, and carrying him to a house where he was held until the next POW transport train took him to the interrogation center. Aunt Beverly is my dad’s youngest sister, who was eight years old when my dad returned from the war. She also recalls him telling her that his wounds were treated with what she remembered as “gen-gen violet”, a liquid medicine that turned his skin purple. This must have been the antiseptic used by the Germans in WWII, gentian violet. Beverly is the only one of my dad’s siblings still alive today, and whose memory of the events of 1944 and 1945 in the Farrar household are helping me put together this history. 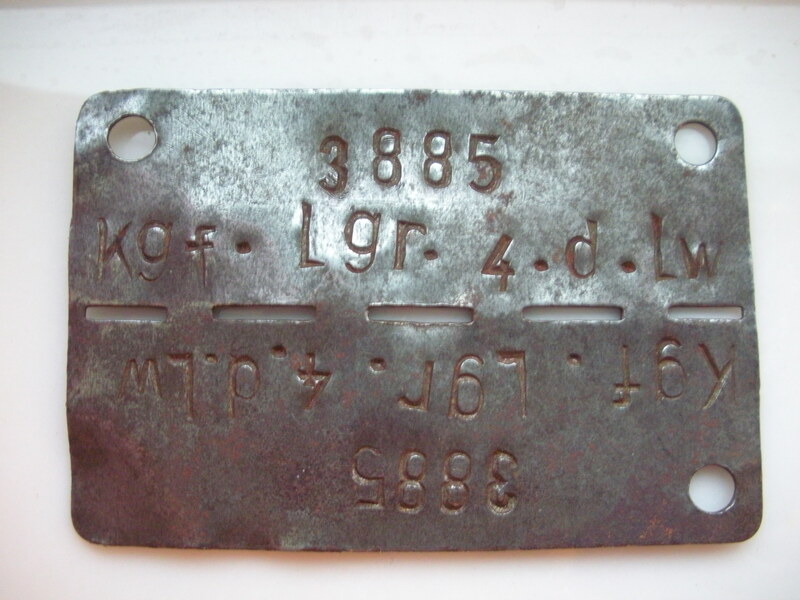 Farrar was held at Stalag Luft IV in Gross-Tychow, Poland, which was a subsidiary camp of Stalag Luft III. Even though this letter is dated October 24, 1944, it was not postmarked until December 15, 1944, and was not received by the Farrar family until January 18, 1945, exactly one week before his mother’s fifty-fifth birthday. Was Farrar telling his mother that the small letter was “hard to write” a way to tell her that he was injured? The reference to being able to “eat a couple [chickens] all alone” was probably a way to tell her he was not being fed much and was starving. 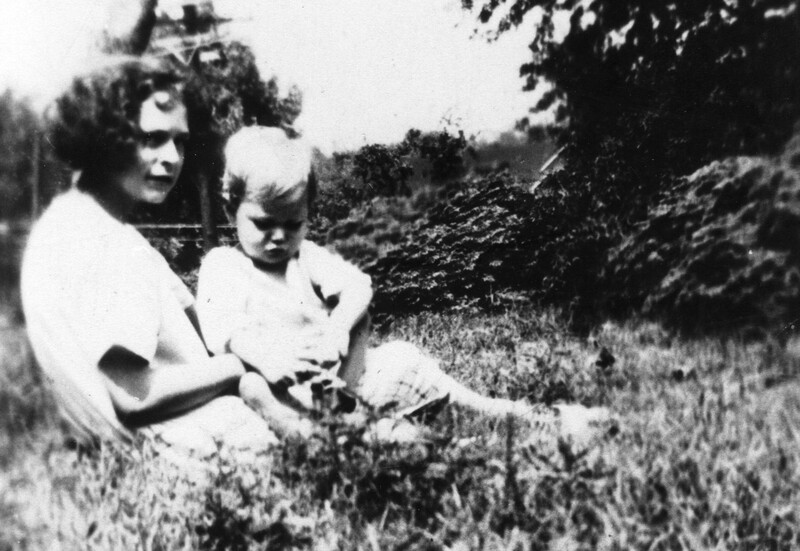 Martha and Gene were a younger sister and brother. Martha would have been 16 and Gene would have been 13 years old at the time of the letter. On October 20, 1944, Oby T. Brewer, the chairman of the Atlanta Chapter of the American Red Cross, sent a letter to Raleigh Mae and Carroll J. Farrar, Sr. expressing sympathy. The Atlanta Chapter of the American Red Cross learns with regret through the casualty list of the newspaper that your son Sergeant George Farrar has been reported missing. We join your many friends in extending our sympathy to you and hope that the War Department will soon be able to send you some reassuring news regarding his safety. During these months of anxiety, we feel sure that you are comforted by a feeling of pride in knowing that your son has rendered a wonderful service to his country. On October 18, 1944, Mrs. Emily Tyler of the Salvation Army sent a letter of sympathy and prayers to George Edwin Farrar’s mother, Raleigh Mae Farrar. I learned through the paper that your son George is reported missing in action. I want to assure you of my sympathy and prayers during these difficult and trying days. May our heavenly Father comfort and strengthen your heart. God is our Refuge and Strength, a very present help in time of trouble, “Psalms” 46-1. AG 201 Farrar, George E.
This letter is to confirm my recent telegram in which you were regretfully informed that your son, Staff Sergeant George E. Farrar, 14,119,873, Air Corps, has been reported missing in action over Germany since 28 September 1944. I know that added distress is caused by failure to receive more information or details. Therefore, I wish to assure you that at any time additional information is received it will be transmitted to you without delay, and, if in the meantime no additional information is received I will again communicate with you at the expiration of three months. Also, it is the policy of the Commanding General of the Army Air Forces upon receipt of the “Missing Air Crew Report” to convey to you any details that might be contained in that report. The term “missing in action” is used only to indicate that the whereabouts or status of an individual is not immediately known. It is not intended to convey the impression that the case is closed. I wish to emphasize that every effort is exerted continuously to clear up the status of our personnel. Under war conditions this is a difficult task as you must readily realize. Experience has shown that many persons reported missing in action are subsequently reported as prisoners of war, but as this information is furnished by countries with which we are at war, the War Department is helpless to expedite such reports. However, to relieve financial worry, Congress has enacted legislation which continues in force the pay, allowances and allotments to dependents of personnel being carried in a missing status. Permit me to extend to you my heartfelt sympathy during this period of uncertainty. In October 1944, the Atlanta Constitution reported two local boys missing in action in Germany. They were both on the Lead Banana on September 28 and were involved in the mid-air collision with Lazy Daisy. Farrar was a regular member of the Buslee crew. Septemer 28 was his 16th mission. Staff Sergeant George Edwin Farrar, 22, of the Air Corps, has been missing in action over Germany since September 28, the War Department has advised his parents, Mr. and Mrs. Carroll J. Farrar, 79 East Lake Terrace. Sergeant Farrar joined the Air Corps in 1942, and won his wings at Kingman, Ariz. He was a gunnery instructor at Kingman until going overseas this June. He has two brothers in the armed forces, Robert B. Farrar, in the Pacific, and Sergeant Carroll J. Farrar, of Greensboro, N.C. It was only the third time Henson had flown with the Buslee crew and he was getting close to the end of his service. September 28 was his 26th mission. 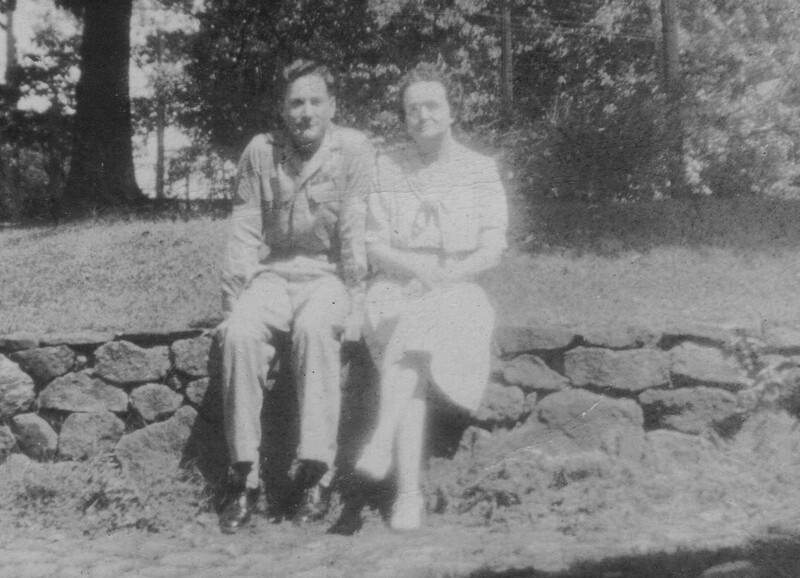 First Lieutenant William A. Henson II, 21-year-old Conyers navigator, is missing in action over Germany, according to a War Department telegram received by his parents, Mr. and Mrs. W. A. Henson, of Conyers, and his wife, the former Miss Harriett Whisnant, of Summerville. Winner of the Air Medal with Oak Leaf Clusters for “meritorious achievement” while serving as bombardier on an Eighth Air Force B-17 Fortress, he was flying as lead navigator when his plane was shot down September 28. He has flown 26 combat missions over enemy territory. A graduate of Conyers High School, Lieutenant Henson had completed two years at the Citadel when he enlisted in the Air Corps. He had served overseas since April, 1944. George Edwin Farrar, my dad, was born in 1921 and was the middle child in a family of nine children. His mother was Raleigh Mae George Farrar and his dad was Carroll Johnson Farrar, Sr. The ages of the Farrar children spanned twenty-seven years, from Geraldine born in 1910, to Beverly born in 1937. 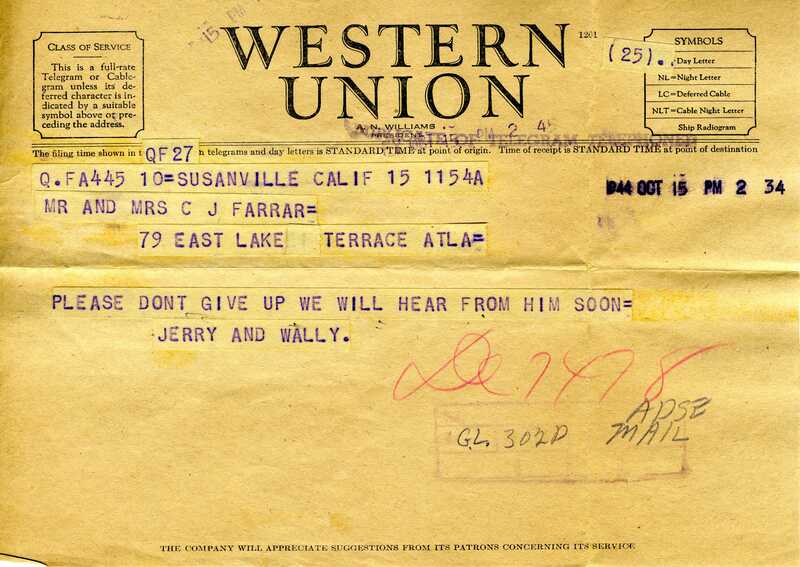 On October 14, 1944, sixteen days after the mid-air collision between the Lead Banana and Lazy Daisy, a telegram was sent to the family of George Edwin Farrar telling them that their son was missing in action. Two weeks after the mid-air collision between the Lead Banana and Lazy Daisy, the original navigator on the Buslee crew, Chester Rybarczyk, wrote to the Farrar family. Rybarczyk flew the September 28 mission with the William J. Blankenmeyer crew, and watched the mid-air collision involving his Buslee crewmates aboard Lead Banana. First of all, I’ll introduce myself. I’m Lt. Rybarczyk, navigator on the crew that George trained with at Ardmore and we flew our first missions together. You probably have the news of him being missing. Well I can’t tell you very much about what happened. I’m not allowed to give such information. I was flying in another ship that day. I saw what did happen. The ship he was in was not on fire and he had plenty of altitude. The crew had a good chance of bailing out and I think they did. You may not hear anything else about him for a little while. He will probably be a prisoner of war and he will be back with you as soon as the war with Germany is over. So don’t take this too bad. I think he is safe and well. He sure was a good boy. One of the best men on the crew. I had lots of confidence in him. He got along swell with the rest of the boys. We never had any trouble with him. He was excellent in his work and gave it everything he had. You should be proud of a boy like that. I know I was glad to have him on the crew. If you should hear anything about him, please let me know. May God Help those boys. The ship Rybarczyk was flying in that day, Aircraft 42-39888, also known as Hot Nuts, “left formation after target for unknown reasons, but returned to base” according to the Sortie Report, apparently in a effort to determine the fate of the crew of Lead Banana. It is unclear why Rybarczyk would state that “the ship he [George Edwin Farrar] was in was not on fire” as all other eye witness reports state otherwise. Perhaps it was simply an act of kindness to give Farrar’s family more hope for his survival. On October 9, 1944, eleven days after the mid-air collision between the Lead Banana and Lazy Daisy, Chaplain Dayle R. Schnelle of the 384th Bombardment Group Headquarters wrote to the family of George Edwin Farrar to notify them that their son was missing in action. APO 557 c/o P.M., N.Y.
May I, as Chaplain of the 384th Bombardment Group, personally, and pursuant to the request of the Commanding General, Eighth Air Force, and in behalf of the Group Commander, express to you our deepest and heartfelt concern regarding your son, S/Sgt. George E. Farrar, 14119873, who is reported as missing in action. I am well aware of the worry and anxiety which is yours. May I assure you that you will be notified immediately should any further word concerning your son be received. May I urge you to remember that you should in no wise consider your son as dead. It is highly possible that he may yet escape or is being held a prisoner of war. In either case it will be some time before any word will be received concerning him. May I add that your concern is our concern, not only of this group, but also of the entire Air Force as well. There is no other information that I can give other than you have already received from the War Department, except, that all mail and packages will be returned to the sender. May I assure you that I believe that our God still answers prayers. I promise that I shall remember him continuely before God as I know that you are also doing. I firmly believe that the hand of God still guides the destiny of His children. May your faith in the ultimate triumph of God’s will give you courage, strength, and grace to meet the burden of this hour of uncertainty. Was this the first word the family had received that their son was missing? A telegram from the War Department was sent later, on October 14, but may have been received prior to this letter (not knowing how quickly mail was delivered in 1944). Would someone from the War Department have delivered the news earlier in person? 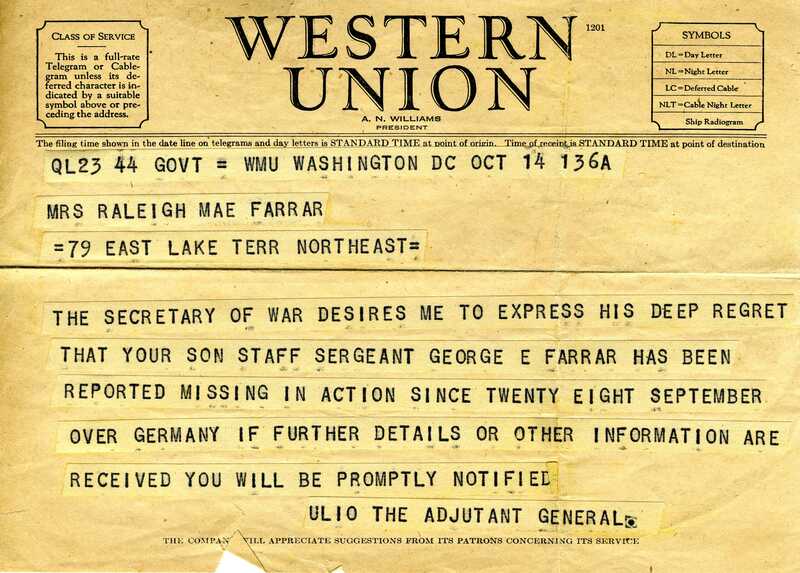 Was the US Army Air Forces already aware that Farrar was reported as a prisoner of war on the Telegram Form dated October 1, 1944? Did seventeen other families, the families of the other boys on both crews, receive this same letter this day?